so he is batmanning out of bohemia, i see. well, lets hope he finds the things he deserves back at home. he'll still keep some ties to DayZ. There's no way he could completely sever all links to the community, or the game. The image I have in my head right now is "KER CHING!, is this the exit?". I want to know if Bohemia are pushing him or he really does want to move on. You reckon the 'creator' would stay til at least the beta -.- . So he got all that juicy early access money and now when he can see that DayZ is going nowhere he buggered off. Good for him also. I fully get where the guy is coming from. It's hard sticking with projects that spiral way out of your control. I wish him the best of luck with his other projects. 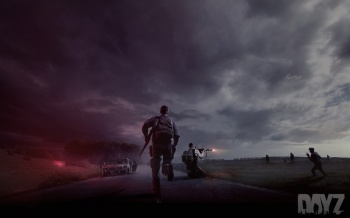 I feel dumber and dumber for having bought DayZ with each passing day. This is the third time I've seen this story this morning, and 90% of the comments are people assuming this spells the end for DayZ. Cause you know. Dean was working on the game ALL BY HIMSELF. Never mind the other developers. They don't matter. Never mind this won't happen for an entire year. What matters is the self made conspiracies that Dean is running off with the cash and letting the project to die. Not surprise really, I mean he did go climbing up a mountain during the development of DayZ standalone. Good Luck Dean and thanks for giving them the push to try DayZ in the first place. Well he does still have nearly a year to finish things up but it doesn't sound overly promising for the future of this project considering right now DayZ is near the bottom end of DayZ games. The sign of a good leader is knowing when to step back and let others take the reins. Just from quickly judging Hall by comments during interviews early on I formed the strong opinion that he was way in over his head. I just hope for the sake of those who have already purchased this that there's enough there to finish the project well. I've never been confident in Hall's ability to actually finish DayZ, so as far as I'm concerned this a good thing for the rest of the team that will be working on the Standalone beta. Maybe they'll finally find some focus after he leaves. Rocket has always come off as overconfident and indecisive to me. The way he left the mod in such a shambles was pretty indicative of his true dedication to the project, and it just seems like he's never been able to settle on a particular vision for the future of the game. Here's hoping the devs actually implement all the features they've been talking about when the beta phase finally rolls around. As of now, Standalone is a pretty empty experience, and once you get past a certain point there's absolutely nothing to do but grief other players. It will need a shitload more content before it can really ever be considered "finished". Also, poor Dean Hall.... Because he's the grenade Bohemian Interactive deserved, but not the one it needs right now.... (or in one year). Well, that was needlessly dramatic. It's fine if he wants to leave, but I don't really think it's as big a deal as he's making it out to be.